What kind of Miles and Points hobbyist would I be if I didn’t provide a review of the newly released Chase Sapphire Reserve card? I mean, in the Miles and Points community, it’s almost as if the Holy Grail’s been unearthed. Just kidding…sort of. Well, before I get into the nitty gritty of Chase’s newest travel rewards credit card, and why so many hobbyists are so excited, a caution to those ready to pull the application trigger. A significant number of reports seem to show the Chase Sapphire Reserve card is falling under Chase’s 5/24 rule. Which means, if you’ve been approved for 5 or more credit cards (from any bank) within the last 24 months, you likely will not be approved for the Sapphire Reserve card. Chase will do a hard pull on your credit, resulting in a roughly 5 point (temporary) drop in your FICO score and you’ll have no new credit card/sign-up bonus to show for the effort. If you’re at or over 5/24, apply with the above in mind. 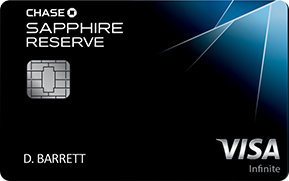 Now, with that out of the way, let’s take a look at Chase’s brand spankin’ new travel rewards card, the Chase Sapphire Reserve. The Sapphire Reserve is offering 100,000 Ultimate Rewards points after spending $4,000 on purchases in the first 3 months from account opening. This is the highest Ultimate Rewards sign-up bonus I’ve ever seen for a personal credit card. The annual fee for the Sapphire Reserve is a whopping $450 per year and is not waived the first year of card membership. But, like many of the premium travel credit cards the Sapphire Preferred is competing with – the American Express Platinum and Citi Prestige – the high annual fees are offset somewhat with travel credits, the details of which I’ll get to in a bit. The Sapphire Reserve earns 3 Ultimate Rewards points per dollar spent on travel and dining worldwide, and 1 Ultimate Rewards point per dollar spent on all other purchases. With Chase, the travel category is extremely generous, including; airlines, hotels, motels, timeshares, campgrounds, car rental agencies, cruise lines, travel agencies, discount travel sites, operators of passenger trains, buses, taxis, limos, ferrys, tolls, bridges, highways and parking lots and garages. And the dining category isn’t too shabby in its breadth, either, including the obvious sit-down restaurants and fast-food/fast-casual establishments as well as Starbucks and the like, bars that don’t serve food and even caterers. So, you can see how this card can really rack up the Ultimate Rewards points if you’re a frequent traveler, especially if your employer reimburses you for your travel expenses. Chase aficionados are intimately familiar with how valuable Ultimate Rewards points really are. The Ultimate Rewards program is my absolute favorite of any of the transferable points programs because of its wide array of travel partners. Hotels: Hyatt, IHG, Marriott, and Ritz-Carlton. Which means, with just the Reserve’s sign-up bonus, you could get 4 saver level, economy class, roundtrip tickets within the continental U.S. on United Airlines. Or, 4 nights at the Grand Hyatt Kauai Resort and Spa where rooms can regularly go for $350 per night or more, depending on the time of year. Those are just two examples of the incredible value you can get from transferring Ultimate Rewards points to your preferred travel partner. But, as the infomercials like to say, there’s more! And…a $300 annual travel credit. The travel credit is automatically applied as a statement credit to reimburse travel purchases charged to your card. What constitutes a travel purchase? Well, since the card is so new, the specifics are still being discovered. However, it is probably fair to assume anything that falls into Chase’s travel category would be fair game for reimbursement. Which means airline charges (airfare included) and hotel charges would obviously be included, but so would things such as train fare, bus fare and even parking garage charges, which could benefit less-frequent travelers who live in large cities and pay a significant amount in commuting-related fees. Since the $300 travel credit is applied annually, you can effectively get paid $150 to hold the Sapphire Reserve card the first year. If you sign up now (August 2016) you’ll be charged the $450 annual fee at the close of your first statement. If you use the $300 travel credit before 2016 ends, you’ll have a fresh $300 to use before your next annual fee hits in August 2017. Meaning, you’ve received a total of $600 in travel reimbursements while paying $450 for the card’s annual fee – making a cool $150 (in travel reimbursements) in the process. The 100,000 Ultimate Rewards sign-up bonus is hard to pass up. When the sign-up bonus is coupled with the opportunity to get $600 in free travel – not considering the annual fee – the Sapphire Reserve becomes an extremely enticing credit card. However, after the first year, it becomes murky as to whether the card is a keeper. If there’s any question that the $300 annual travel credit would be used, then this definitely is not a card you’d want to keep year two and beyond. And even if you do fully use the $300 travel credit each year, you have to look closely at the other benefits to see if holding this card outweighs holding the Chase Sapphire Preferred, the Reserves’ less benefit-laden sibling. Because, when you take the $300 travel credit out of the equation, you’re left with a $150 annual fee credit card. The Sapphire Preferred’s annual fee is $95, and offers the ability to build Ultimate Rewards points at the rate of 2 points per dollar spent on dining and travel, or 1 Ultimate Rewards point less than the Reserve. Others have done the calculation, looking at whether the increased annual fee and greater Ultimate Rewards earning power is worthwhile, and it pretty much is a wash when compared to the Sapphire Preferred’s earning levels and annual fee. So, from that perspective, it’s probably better to go with the Sapphire Preferred and its lower annual fee. But, that’s where you also have to weigh the other perks associated with the Sapphire Reserve and see if they are actually worth that extra $55 in annual fee to you. A strong argument can be made for many of the perks being more than worth that $55. The airport lounge access alone – if you’re going to use it – could provide more than $55 in benefit annually. Dig deep, both into the card’s fine print and your soul to see if you really can justify the higher annual fee of the Reserve long-term. Chase has put forth a worthy contender in the premium travel rewards credit card category. Some may even say it’s the best premium travel rewards card at this point because of its sign-up bonus, association with the extremely valuable Ultimate Rewards program, and the largest, and most versatile travel credit – $300 – of all the premium cards. Considering the sign-up bonus – potentially worth $1,500 or more – and the first year opportunity to obtain $600 in travel reimbursements, all for only $450, this card should definitely be on your short list for upcoming applications. Just remember the 5/24 restrictions I mentioned earlier in the piece. That’s a hurdle many, unfortunately, may not be able to overcome while in pursuit of this highly coveted travel rewards card.